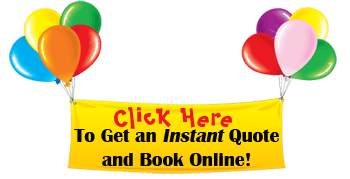 Get an instant price quote by clicking the button below. You can also text or call 914-481-2686. 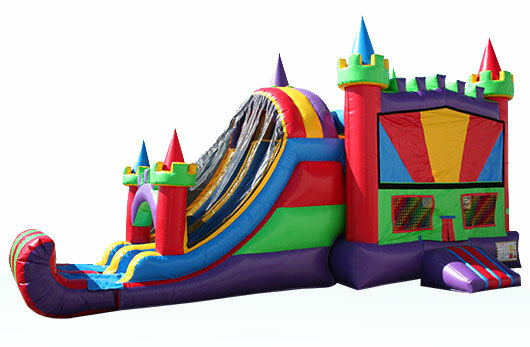 Our Royal Bounce House with Slide Combo is the ultimate in party entertainment! Beautiful, brilliant colors, a basketball hoop, a large bouncing area and a huge 12 foot, double-lane inflatable slide. Two lanes on the slide make great fun for slide races.Fiesta Bounce had this bouncy castle with slide designed and built specifically to our safety standards. Our most important goal is keeping our children comfortable, happy and safe while they play. Setup space required: 30′ x 20′ rectangular area. 15 Feet Tall. Due to the size and weight of our Royal Bounce House with Slide Combo , we need know if there are stairs, steep hills, rocky terrain, narrow entrances, or any situations that require extra labor on our behalf. In addition to Bounce House Rentals in Westchester County, NY, we also offer our Party Rental services in The Bronx, NY and surrounding areas. If you’re looking to rent a bounce house in Westchester County, Fiesta Bounce Party Entertainment is a one-stop-shop for all your party and bouncy house rental needs. We don’t just deliver bounce houses in Westchester NY we cover NYC and some surrounding areas.